Cozy up and relax at Twiga Beach Bungalows! Our property is a little piece of paradise- fill your day with boat trips, unwind on the peaceful beach a minutes walk away, experience the local culture, or simply lounge about at Twiga Beach. Breakfast is included in price of room. Each room is fully equipped with linen, towels, and private terrace. WiFi is available. We offer an affordable restaurant and bar on site, serving a well-selected menu of local and international cuisine. Kizimkazi is one of the less touristy areas on the island, and an ideal location for many different ocean trips, especially swimming with the Dolphins in their natural habitat. It is the perfect place to experience Zanzibar culture, with all the luxuries you would need for your tropical beach vacation! Cozy up and relax at the enchanted oasis of tranquillity at Twiga Beach Bungalows. Located at the most southern point of the island, a village called Kizimkazi. Ideal place to explore the surrounding islands, have a fresh seafood bbq lunch on the sandbank, or swim with the dolphins in their natural habitat. 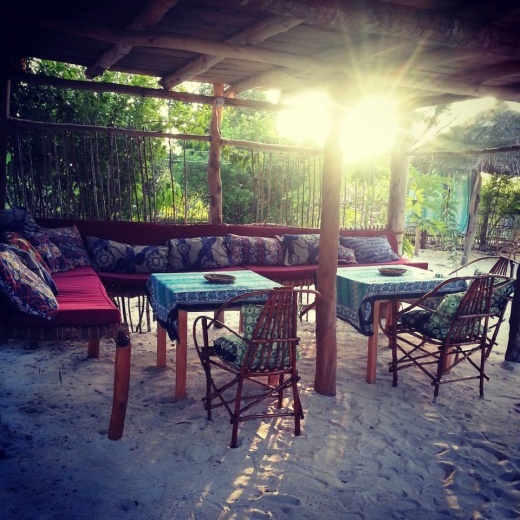 Fill your days sailing on the Indian Ocean, relax at Kizimkazi's beautiful and peaceful beach, or simply lounge about on a swinging bed at Twiga Beach. Our white sandy property is located a short walk from the beach (2 minutes), and one hour from historical Stone Town. We are a prime location to explore the island's famous trips and excursions, and our village remains secluded enough from the busy, tourist areas that you will be sure to find peaceful and quiet relaxation. It is the perfect place to experience Zanzibar's beautiful culture, tailored to suit your ideal beach getaway. You can get around using our own private transportation, taxis for large groups, or even the local Dalla dalla. Just tell us where you need to go, and we assist you with the appropriate means to get there!